PASADENA.–Hampered by sickness and injury, the Polytechnic girls limped to a lopsided loss at Flintridge Prep two weeks ago, and early in Thursday’s wild card play-in game, it looked as though they were again having their hats handed to them. “We started pretty ugly,” admitted head coach Kim Weber. After scoring just a single point in the entire first quarter, the Panthers regrouped, had evened the score by halftime, and went on to a gutsy 38-32 win over the Webb Schools in their CIF Southern Section Div. 5AA matchup. “At some point, we just clicked,” said sophomore guard Kristin Toyota, who finished the night with nine points, all coming via the three-point shot. 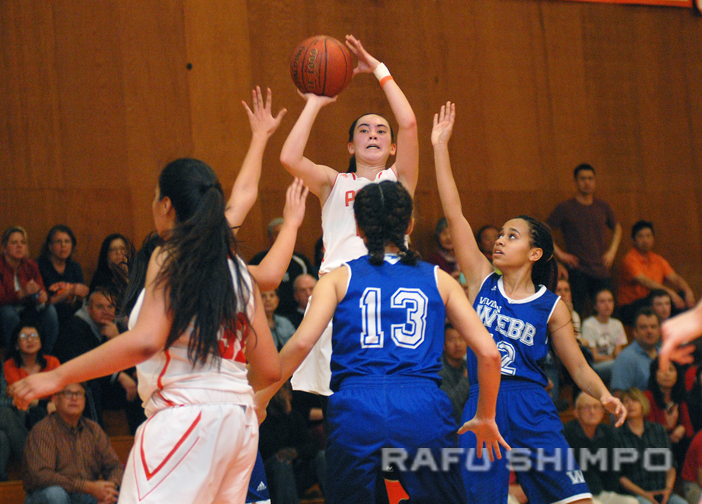 Kristin Toyota’s long-range shooting netted nine points for the Panthers. Trailing by three at the start of the fourth period, junior forward Sarah Johnson began to take control of the game. After her slashing layup narrowed the deficit to one, she converted two foul shots on Poly’s next possession to put her team ahead. From that point, hardscrabble play made the difference in the final score. The battle for every ball was evidenced by Johnson’s lunging dive for a Webb inbound pass with just under a minute and a half left in regulation. 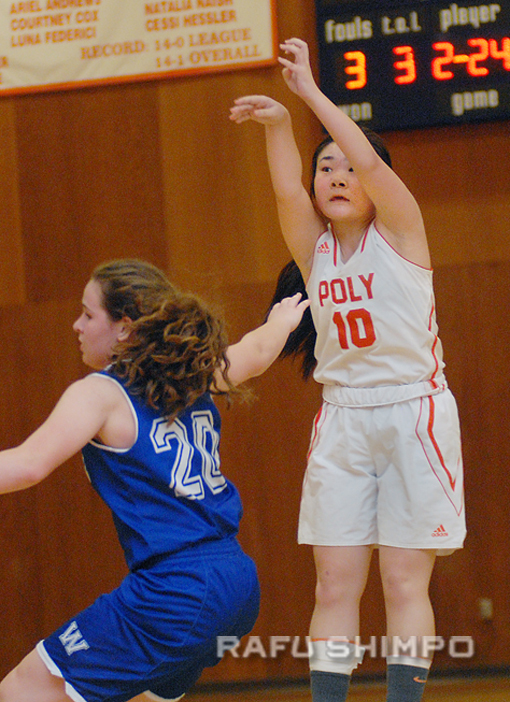 Poly was up by a point on Toyota’s three-pointer, and the defense made the lead stand. “I felt like my shot wasn’t falling, so I had to get back to making a better effort on the hustle plays,” said Johnson, who finished with 15 points. Kylie Kishi added two for Poly, who advance to face Buckley in the first round, 5 p.m. Saturday in Sherman Oaks.